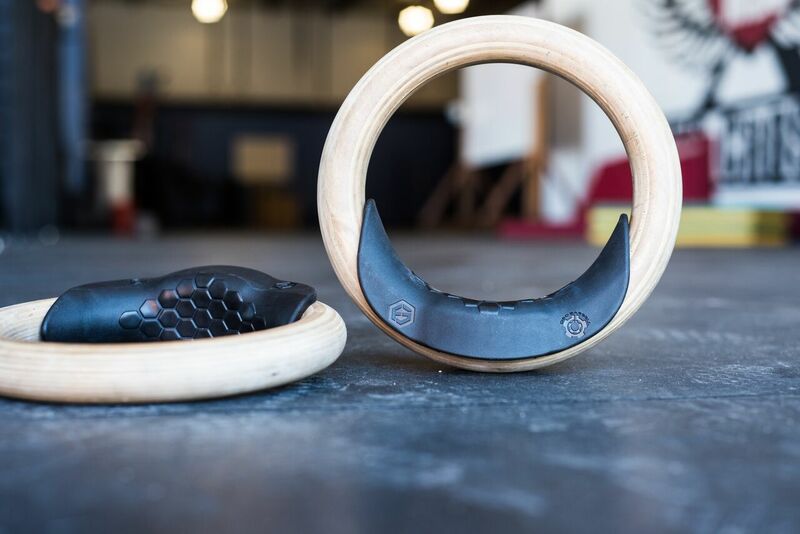 Made from a durable molded rubber, False Grips are convenient, portable attachments that snap directly onto an existing set of gymnastics rings—creating an improved grip with max stability and reduced risk of skin irritation or tearing. False Grips are manufactured in the USA, backed by a lifetime warranty, and effective for a wide range of movements, from ring dips, push-ups and rows to high-intensity muscle-up progressions. The grips hold firmly to any standard gym ring, but are also simple to snap on and snap off without having to take down the ring itself. From beginners working up towards the muscle-up to experienced pros looking to put together multiple muscle-ups more effectively, False Grips can serve any athlete's ring regimen. The grips’ patent-pending platform allows for more contact with the surface of the palm and balances the heel of the wrist on the center of the rings. The resulting improved grip increases muscle activation of the forearms, biceps, and triceps for a stronger pull. Patent-pending band cutout allows ¼’ to 1” rubber bands to be quickly and conveniently attached for specific muscle-up drills. Easy to Use DrillsProvided drills and videos will progress you through your sticking points to earn your muscle up. I have been crossfitting for 5 years now and felt relatively comfortable performing kipping bar muscle ups, but have always had problems with my false grip and ring muscle ups. When I was first introduced to the oso false grips it was a game changer. The first thing I noticed was a weakness in my overall grip strength, I could barely hold the “false grip” so much so that I had to take it down to the ground and slowly work my way back to hanging on the rings. Once a correct grip was established and the strength improved muscle ups became a lot easier! The False Grips are a great product whether you are a beginner or someone looking to build upon the skills you already have. The False Grips solved a problem I didn’t even know I had that kept me from getting myself on top of the rings. I highly recommend them for people who are tired of tearing their hands and generally want to be safer in muscle up practice! I highly recommend this amazing training tool for anyone that is serious about MU/PU or improving grip strength!